See the Capital of Costa Rica through the Window of a Helicopter! 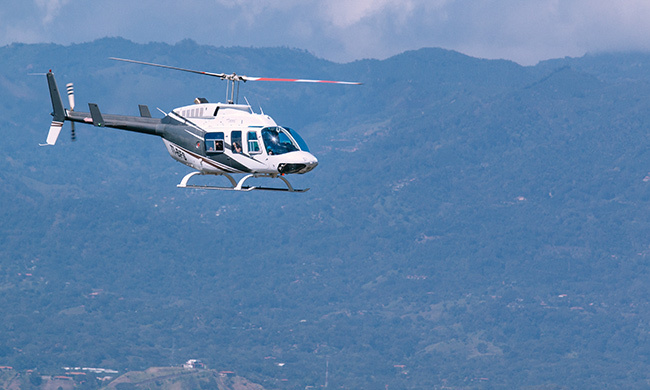 What better place to try out a helicopter ride than during an adventure-filled trip in Costa Rica? In this tour, you’ll see the Costa Rican capital and its surrounding areas from above. Start out from the Tobias Bolaños Airport on the west side of San José. First up will be a privileged view of the National Stadium and the massive Sabana Park, known as the lungs of San José. As you start the tour, the aerial view will allow you to see the layout of the Central Valley of the country. The majority of the population lives in this area, which many tourists never visit. Your tour will continue as you fly over cities and towns such as Heredia, San Pedro, Curridabat, Escazú, and Santa Ana. The city is on a plateau at 3,700-foot elevation, with mountains and valleys surrounding it, so you will be able to see some of the beautiful green views that make Costa Rica famous. Talk about great shots for Instagram! You will also get a first-hand look at the impacts of urban sprawl in a growing city. The city borders are now blurred, with previously independent nearby towns and cities becoming virtual suburbs of the capital. The Greater Metropolitan Area is now home to about two million people, almost half of the country. And you will get to see if from the air! As you head back, you’ll get a lovely view of the Pico Blanco mountain and the Cross of Alajuelita. When you land, you’ll truly be able to say that you have a unique perspective on Costa Rica!